It had been a little over a year since our last visit to The Counter, and the newest one had just opened a few blocks from TheBurgerBusters world headquarters. Fat Bruce Lee, Chi Burger, Special Guest, and I reluctantly made our way there with the hope that this location would serve up a more palatable burger than the Santa Monica location. We arrived just before the lunch rush, and the restaurant was only about 1/2 full. We sat at the counter, and ordered our burgers via the "build you own burger" method. I ordered my cheeseburger Medium, since the counter person at The Counter could tell me nothing about the cuts of beef in the burger other than what I could read on the menu. This was not a great sign when I stopped to consider that The Counter only served burgers, and the staff couldn't tell me about the components of the only thing on the menu. Then, we waited, and waited, and waited. After about 15 minutes a couple of plates of lukewarm fries arrived. Then we waited some more. This was puzzling, since no less that 4 manager types were milling about the front of the house, and one would have expected one or more of them to be A) running food out of the kitchen, and/or B) raising hell in the kitchen and expediting food orders. About 15 minutes after that, my lukewarm burger arrived on a dirty plate. I held onto my burger as I waited for a clean plate to come back. This took several minutes, which left me wondering why it was so difficult to locate a clean plate in a restaurant. The new plate had food crusted on the underside, but I sort of knew the score at that point. I counted myself lucky to have a plate that was clean on one side. In addition, we ordered as a group, but Fat Bruce Lee's meal (salad) arrived within 5 minutes. This was very poor form on the part of the kitchen and the front of house staff. Yes, this location had only opened a week ago, but since they were charging full price, it was fair to expect full service and full sanitation. Service kinks should have been worked out well in advance. This was one of many The Counter locations, so it was not like they were breaking new ground. The Beef: The burger meat at The Counter was a proprietary blend of 100% natural, hormone-free, and antibiotic-free Angus from Meyer Natural Angus. I guessed that The Counter took delivery of their beef in pre-ground form, because it would have been difficult to explain the rubbery texture otherwise. The grind was on the fine side, which didn't help the mouth feel. The beef was neither juicy not dry--it was neutral in that regard. The flavor of the beef patty was relatively neutral, as well. It was mildly beefy, and that was it. There was no trace of funk or mineral flavors fin the "proprietary blend." It was very likely that Chuck was the dominant player in the patties at The Counter. If the burger had been served warm enough, it would have been average. 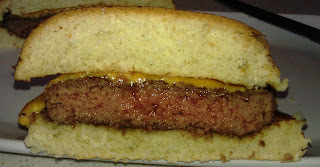 The Seasoning: The exterior of the mild burger patty was barely dusted with seasoning. This was unfortunate, because a little salt and pepper would have gone a long way. The Sear: *sigh* There was no sear. 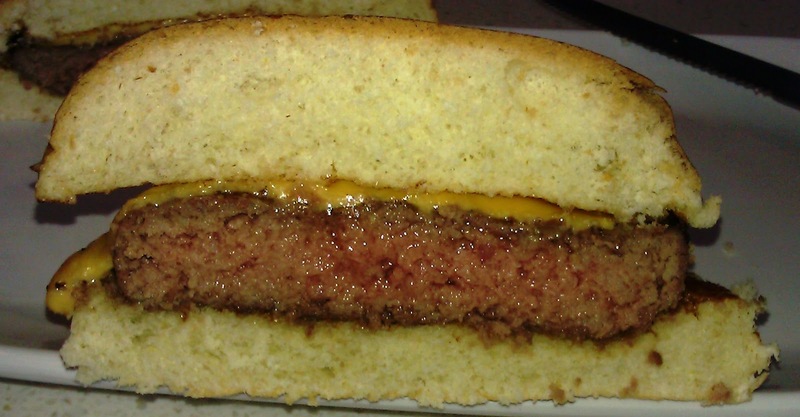 The burger patty was cooked on a too cool grill, and it only received nominal grill marks. It was tough to forgive a 30-minute order to plate time frame. The Preparation: It was impossible to tell what was going on in the kitchen of The Counter, but I was pretty sure that it wasn't cranking out excellent burgers. 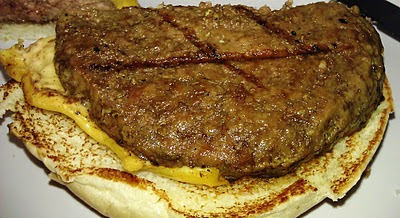 The rubbery beef was most likely ground by the supplier and delivered as pre-formed patties. The uniformity of the patties and the lack of interesting flavors and texture suggested that this beef had been fully mechanically processed and then shipped. The gas grill was clearly far too cool for the task of cooking burgers. On the plus side, I ordered Medium, and they nailed that. The lukewarm temperature and rubbery texture of my burger suggested that the burgers were cooked in advance and assembled at a leisurely pace. The Cheese: The Counter offered 12 cheese choices, and I went with American. The cheese was melted properly, and it was otherwise just fine. The Bun: The bun was also lukewarm upon arrival, and the lack of crispness in the competent looking toasted surface suggested that the buns were being toasted ahead of time and then set aside on a cool shelf to be used when the burgers were ready. Otherwise, the standard, unseeded, neutral buns were fine. The Meat To Bun Ratio: This was fine. 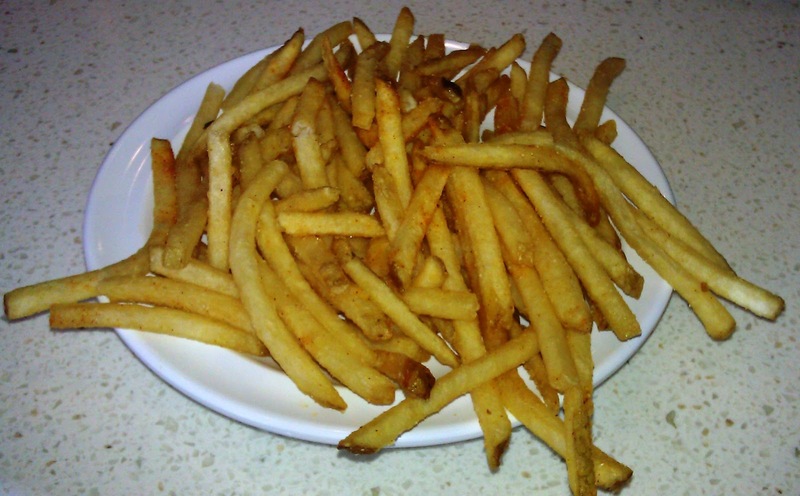 The Fries: The fries arrived crisp and properly seasoned. The fries also arrived lukewarm. The peel-off, shoestring fries would have been fine had they been served at the proper temperature. a) Tomato Slice: fresh and juicy. b) Hard-boiled Egg: lukewarm (yikes) and mealy. I think these showed up in the Sysco Foods truck. c) Sliced Black Olives: lukewarm and bland. d) Dill Pickle Slices: fine. The Value: A year ago, a really bad 1/3 pound burger at The Counter in Santa Monica, CA was about $7. 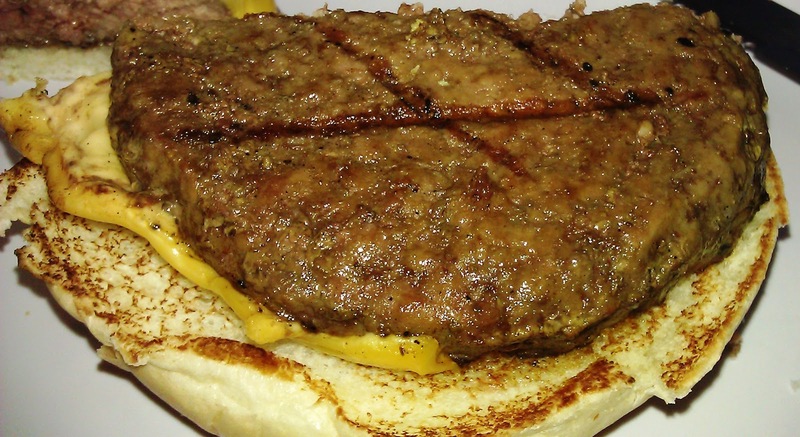 A year later, in 2011, the same 1/3-pound cheese burger went for $8.95...amazing. Last year, The Counter comped my burger, because they made a mess out of the preparation. I took three bites and gave up. 9 bucks would have been steep for a good cheeseburger without fries. Considering that a stingy single order of fries was about $2 more, the value was poor at The Counter. Burger Review : I have tried The Counter 3 times, and the burgers have been inedible on the most recent 2 of those occasions. If you suffer from sensitive teeth, and biting into hot or cold foods is an issue, then The Counter would be a safe choice. My mother and aunt said this was the best burger they've ever had. Between them they've probably had 7 burgers in their lifetimes. I agree about the long wait time and the average, rubbery burger. Pete: "This was puzzling, since no less that 4 manager types were milling about the front of the house." Yes, this is always a bad sign with any store or restaurant. The Counter seems to think it's somehow hip to serve the fries long before the burger arrives. But by the time the burger is served all the fries have been massacred. So you have to order more frie...ahhh, I get it. My beer was barely cool...forget about cold. I saw Reba McEntire walk by. He jerked me around for three months with no definitive offer while he was trademarking the phrase I thought of and had secured the domain for ten years before considering selling it. I hope his restaurants go under; from the Burgerbusters reviews, 'could happen!